I’ve been away from the blog a bit because we’re finishing articles for our Premium magazine this month and I’ve been buried in articles about visual spatial learning and preferred learning strategies of boys. Now I know that it’s pretty common for the practice of ‘guessing’ to get a pretty bad rap in the context of education, but that is why I found it refreshing to see I was not alone in appreciating the positive side of the guess. If you study the preferred learning strategies in boys in math class, for instance, early research studies found that boys preferred developing their own ways of solving math problems to the most obvious routes, like counting or standard algorithms that were being taught in class. The practice intrigued me, especially as we had often found when interview accomplished dyslexic engineers of various sorts that they described similar processes in their math school, even if developing their ‘own ways’ were slower or sometimes led to more errors. What many told us is that it wasn’t a choice – it was the only way they could learn. Neuroscience wonks could say that was because memorization of multiple steps in sequence was impossible (rote memory limitations), they had to lean that way because they could use strengths in pattern matching and reasoning based on big picture concepts to arrive at the correct final answer. Regardless, it’s good to know, especially if the standard ways aren’t working for a particular student or students you have in mind. 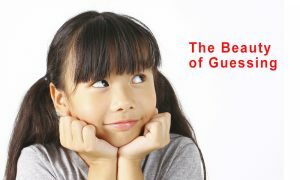 It’s fine to not rely on guessing and to develop a practice of rigorously testing the bases of guesses, of course, but it’s also fine to see the upside of what the guesser is doing. 1) you start off right away. 2) it gets you into the problem, you don’t have to have this “I haven’t been taught this, so I can’t do it ” attitude and then feel you have to wait for someone to tell you how to solve it. 3) you can solve many equations this way, not a trivial few, as well as solving other types of problems. Don’t be discouraged if you guess wrong the first few times; keep trying, you can do it. Along with guessing goes the question-are you getting closer? Is the guess too big or too small? 5) you might even come up with different ways to solve the same problem, which would be very good. Then you would have a check to tell you if you are right or not, like when taking a test, and without having to rely on someone else to tell you. Want to learn more? Support Dyslexic Advantage by becoming a yearly Premium Subscriber. You’ll also get a free subscription for a teacher or tutor you know, too! [PREMIUM] How Do Math-Talented Dyslexics Do Calculations?